Update 1/2/2017: I debated whether I could recommend this product or not. Honestly, I hated using it and didn’t want to smooth any more on my hair in the morning because I am paranoid about buildup (of the polyquaternium-11), and I swear my skin felt sticky around my hair line all the time. However, this product had combed okay, my hair felt soft and glossy, and though it wasn’t clumping, it did a bit. But what made me decide was that right before my shower, I undid my hair to put it in my night bun. And then I got carried away reading some plant books for a while (no water had been turned on or anything yet). And when I looked in the mirror, my hair told me everything. 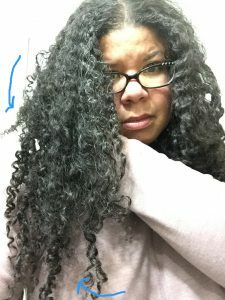 It was undefined, and the curliest parts of my hair (the top, back of my head) were beginning to look very fuzzy to the point of verging on matting. 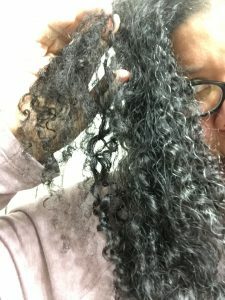 No matter how much product I’d put on, this hair never felt clumped. And my hair seemed to be getting bigger and frizzier. Not that there’s anything wrong with that. For me, frizz turns to mats quickly. If it didn’t, I’d totally wear my hair gloriously big (like Reggie Watts on James Corden). But this was only day three, and I hadn’t even been caught in the rain. This was a head of hair waiting to turn into a big mat the moment it got the chance (from rain, wind, humidity, or just wearing any part of it down). And my method is all about protecting our hair. 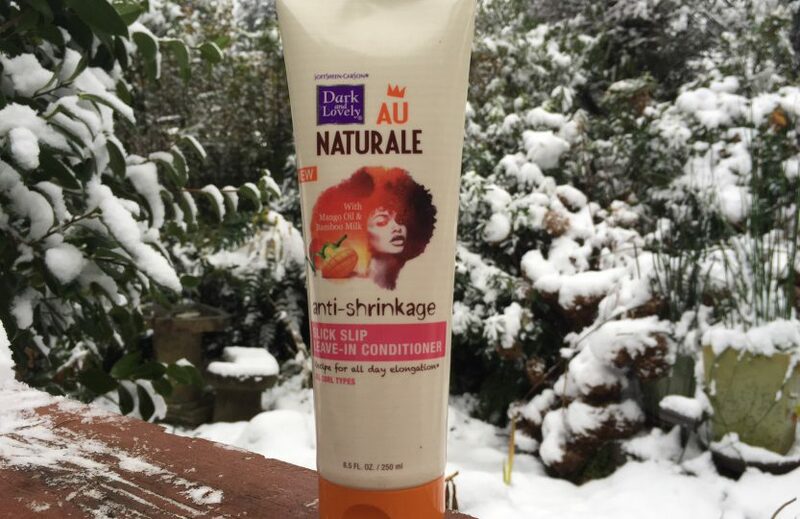 Keeping it happy and clumped and weatherproof with one product. And this particular product was not delivering that. *However*, I do have some grey hairs. And they are showing in these photos. After a lifetime of chemically altering my hair, I just want to be honest with it now. In addition to straightening it, I used to dye my hair every color there was, including blond, orange, red, light brown, and purple-black. Now I want the hair that grows naturally out of my head, including my true hair color. Plus, ever since I was a child, I thought silver hair was really beautiful. So I’m letting my hair go grey. Can you imagine how cool it will be to have waist length curly silver hair? Oh my gosh I can’t wait. Hurry up and go all grey, hair! The only worry is my mom is in her mid seventies and I don’t think she’s fully grey yet. So I have a ways to go. But I wanted to let you know you aren’t imagining the silver hairs in the below photos. Okay, that was a long way to tell you I don’t recommend this product. But now you know why. Update 12/31/2016: This was an interesting comb. First, it’s really watery, sort of like thick skim milk. Instead of putting in a handful each side, I put in two full handfuls per side of product. The directions said to towel dry hair first, but I put my products on in the shower. Plus, I wanted to treat it like all the other products I try out so I can properly compare how it works to others. But to ask to add it to towel dried hair seems to me an excuse to get away with adding more water to the product, which makes it less concentrated (cheaper). Combing with this was interesting. It felt like it wouldn’t comb well, because it does have a sticky finger feel. But at the last minute my comb did glide through okay. But I must confess I really don’t like how this product feels on my fingers. I think this is a personal thing, though. Also, it feels really light, like in my fuzziest spot at the top back of my head didn’t feel like this clumped it at all. The funny thing is that on the front of the product bottle it says: “Recipe for all day elongation*”. But it has a star. So the * on the back says: “When using Coil Moisturizing Souffle, Curl Defining Creme Glaze, or 10- in-1 Styles Gelee as a part of your Au Naturale regimen”. Meaning it only works with a whole line of products. But, as you may know, I don’t believe in lines of expensive products. If you choose well, you only need one product. It all comes down to understanding the ingredients. As this is drying, a sticky-ish film formed on my neck where my wet hair touched it. I wiped at it with a wet washcloth. I’m pretty sure it’s that tricky polyquaternium-11. It’s sort of sticky, but not fully sticky. And if I wet it again, it goes back to being slippery. I’m really curious how this product will dry. I think the clumping of the product isn’t in weighty ingredients like stearyl alcohol (or the other similar ingredients like that that usually appear second or third on an ingredient list), but is relying on the polyquaternium-11 (and getting you to buy lots more products in the line to add weight instead). Oh, another (geeky) note on this: the front picture says “With Mango Oil & Bamboo Milk”. By milk they mean sap. Anywho, there’s a drawing of a mango, and what’s supposed to be a bamboo to bring home the point. Funny thing is, that isn’t a bamboo they’re showing. It’s a dracaena, which is commonly sold as a “lucky bamboo”. But it isn’t a bamboo. I know, I’m a plant geek. But I just thought it was funny that the image they’re showing of the bamboo sap that’s supposed to be in there isn’t an image of a bamboo at all. Update 12/30/2016: I just went through the ingredients, and everything seems okay. The only ingredient I’m not confident in is polyquaternium-11. Now, I’m fine with polyquaternium-10. This is an old friend that’s in most of my favorite conditioners. But it looks like polyquaternium-11 is a bit stronger, and is beginning to lean towards being a styling /hold ingredient. But it isn’t there yet. It’s borderline. Now, polyquaternium-16 is a definite avoid, because it’s fully crossed over to the sticky/styling product side. So I’m going to give polyquaternium-11 a chance. I’m hoping that, though it’s stronger than 10, it hasn’t crossed that fine line into being a hold ingredient. It isn’t supposed to be sticky at all, so I’m willing to give it a try. Original Post 12/11/2016: I found this product at a Rite Aid in Louisville. It hardly has a scent. 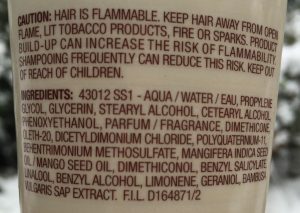 The back of the tube cautions you that hair is flammable, which I don’t think I’ve seen a product do before. I’ll try it out as soon as I look up the ingredients and they all check out.